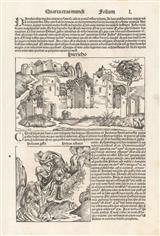 Description: Early incunable woodcut view of Jericho from the Nuremberg Chronicle. Jericho, famous for its Biblical walls, is one of the oldest inhabited cities in the world. Description: Damascus. Town view with text above. Original colour. Description: Damascus. 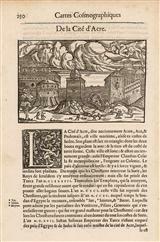 Woodcut panorama accompanied by text description. 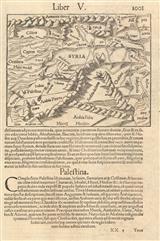 Description: Ptolemaic woodcut map of the Cyprus, the Levant, Syria, and Iraq from the 1541 edition of Ptolemy's "Geographia" with maps by Laurent Fries, text by Michael Servetus, and published by Gaspar Treschel. Description: Ptolemaic woodcut map of the Holy Land from the 1541 edition of Ptolemy's "Geographia" with maps by Laurent Fries, text by Michael Servetus, and published by Gaspar Treschel. 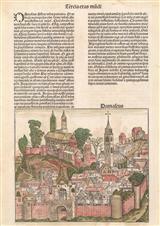 Description: A miniature woodcut map of the Holy Land, taken from the seminal 16th century work, 'Cosmographia'. Description: Acre. Beautiful woodcut of the fortress at Acre in the Levant.Descriptive text covers the lower half of the page. Black and white. Description: Magnificient bird's eye city view of Damascus in rich original colour. Description: Stunning map of the Holy Land compiled with information from Dutch astronomer, Peter Laicksteen. Depiction of Jonah and the Whale to lower left. Original colour. Description: Lovely example of Ortelius's map of Palestine or the Holy Land comprising of the Levant from the Lebanon to the Nile Delta. Original hand colour. Description: Mount Calvary. Early black and white engraving. Description: The Holy Land during Biblical times. Coloured. Description: The Exodus of the Israelites. Rare Michael Sparke edition with English descriptive text on verso. Coloured. Description: Holy Land, part of the Nile Delta, Sinai and Red Sea. Oriented East West. Latin text on verso. Original hand colour. Description: Stunning copper-engraved map of the Ancient Holy Land from Japho to Ashdod, with scenes and places mentioned in the Old Testament. Strong impression. Description: Canaan, at the time of Abraham. The map travels into the Asian continent as far as the Babylon, and the Tigris estuary.